Schneider established its Canadian trucking operation in the Toronto area in 1990, and we’ve spent decades expanding and enhancing our Canada truck driving jobs. 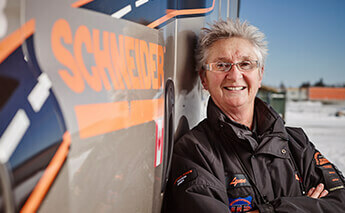 Join the thousands of Class AZ drivers who have advanced their career with Schneider. Schneider’s robust freight network on both sides of the U.S./Canadian border means you’ll always have loads to haul. Southbound border crossing drivers run closed-loop through four primary gateway cities -- Chicago, Indianapolis, Columbus and Harrisburg -- ensuring a quick return across the border. Haul dry van freight in standard 53-foot trailers to a wide variety of customers within a 500-600 mile radius and back and forth across the border. Schneider moves almost 1,000 shipments a week across the border, and our 24/7 border crossing team and long-standing history with both U.S. and Canada Customs means a seamless driver experience for you. We are a C-TPAT (Customs-Trade Partnership Against Terrorism) and PIP (Partners in Protection) approved carrier, which means access to FAST (Free and Secure Trade) lanes, ability to move expedited freight, reduced Customs exams and quicker processing at the border. You Transflo the paperwork, and we’ll ensure your eManifest is ready before you even reach the border. Schneider has introduced multiple recent pay increases — with mileage rates up as much as $.08 per mile the last few years. Drivers can now earn up to $72,000 (CAD) per year, including additional performance pay up to $.04 per mile and automatic annual raises. Drivers also have access to an extended health care plan (covers qualified drugs, prescriptions and paramedical services), vision coverage and a dental plan that covers standard preventive care at 100 percent. The RRSP (Registered Retirement Savings Plan) includes a company match of $.50 for each dollar you contribute up to 6 percent. Your equipment and technology impact your livelihood as a truck driver. Schneider gets it. That’s why our Freightliners within the Canadian fleet average less than three years old, with 95 percent automated transmissions. Most new trucks have power inverters, auxiliary power units (APUs), memory foam mattresses, refrigerators and more. Did you know? Due to Schneider’s leadership in providing careers to military veterans, we’ve received two Canadian Ride of Pride military tribute trucks. Schneider’s facility network includes 56 locations, with our Canadian facility in Guelph, Ontario, and three additional drop lots in Canada. The full-service facilities feature free parking, showers, laundry, maintenance, cafeterias, exercise equipment, ATMs, drop boxes, WiFi, company kiosks, company cars and more. Of course we also boast a Driver Services team dedicated to helping you get the most out of your truck driving job in Canada.